Apple is cooking up a new touch screen tablet PC and this is something to watch out for around March next year. The Apple tablet or iPad as they call it looks more like a mutation of an iPhone and a MacBook with a screen size of 10.1 inches equipped with a touch sensitive LCD which is about 5-6 times the resolution of an iPhone screen. 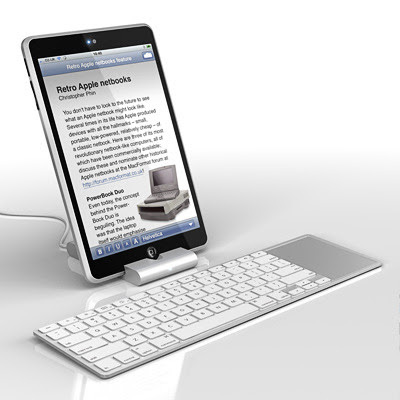 Steve Jobs himself envisioned this next-level 10-inch 3G-enabled wireless device with a multi-touch screen. This iPad tablet PC will surely reward you with a better movie experience, as according to sources its video capability is something for the future gadgets to beat because of it's improved technology giving you that ultimate video experience. The expected retail price might fall at around $500 - $750 with a moderation of 1-1.5 million units to be sold per quarter. As of now, every bit of information that's coming out about this awaited tablet PC remains unofficial as Apple executives still have not straightforwardly acknowledged its supposed forthcoming.